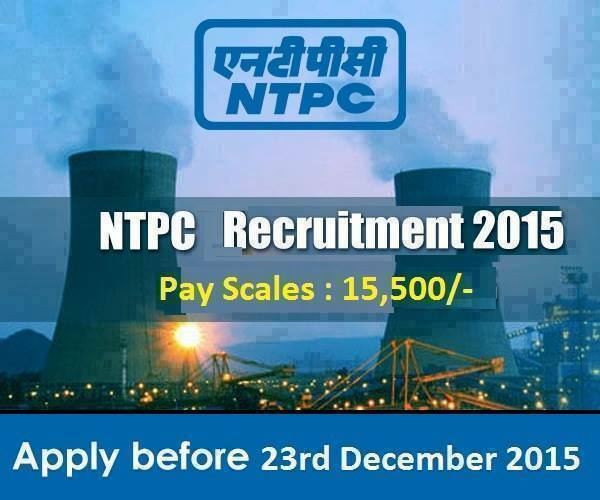 Are you searching for NTPC Recruitment Application Form? Find here all details. Fee : Candidate belonging to General/OBC category/XSM is required to pay a nonrefundable registration fee of Rs. 150/-. The SC / ST / PWD category candidate need not pay the registration fee. Service Agreement Bond: The selected candidates who belong to General and OBC categories will be required to execute a service agreement bond of Rs. 2,50,000/-(Rs. 1,25,000/-for candidates belonging to SC, ST categories and PWDs) to serve the company for at least 3 years after successful completion of one year training. Selection Process : Eligible candidates should have appeared for Graduate Aptitude Test in Engineering (GATE) 2015. Based on the GATE-2015 marks and requirement, candidates will be short listed for Personal Interview. Candidates need to secure minimum qualifying marks in the personal interview before being considered in the merit list. Compensation Package: NSPCL offers one of the best pay packages in the industry. Selected candidates will be placed in the pay scale of Rs. 20600-3%-46500 at the basic pay of Rs. 20600/-during one-year training. These candidates will be absorbed after successful completion of training as Engineer in the pay scale of Rs. 20600-3%-46500 at the basic pay of Rs. 21220/-. Besides basic pay candidates will also be paid Dearness Allowance and will also be entitled for other perquisites & allowances under cafeteria approach and other benefits such as leave, medical treatment, Provident Fund, Gratuity, etc. will be admissible as per company rules in force from time to time during training / after absorption. Placement: The selected candidates shall undergo one year training at various places. The final place of posting will be decided after completion of training, based on performance during the training and requirement. Candidates can be placed, across the country, in any of the functions at Units/ offices of NSPCL.